On April 25th, 2015, Nepal was hit by a 7.5 magnitude earthquake, killing over 8,000 people and injuring more than 21,000. The earthquake shook infrastructures, leaving many homeless, and damaging few of the most popular world heritage sites in Nepal. In the following days, aftershocks, rain and bad weather made rescue operations and relief work difficult. I’m part of a community of mappers and cartographic emergency responders called the Humanitarian OpenStreetMap Team (HOT). HOT along with OpenStreetMap, a global community of over 2.1 million members, activates to help humanitarian agencies in times of crisis to provide up-to date geospatial information about settlements and infrastructures. HOT invites volunteer mappers to map buildings, settlements, roads, schools, hospitals, water sources, helipads, open areas and anything that can have a practical application in aiding disaster response. The Nepal earthquake had a few of us not sleep for weeks. 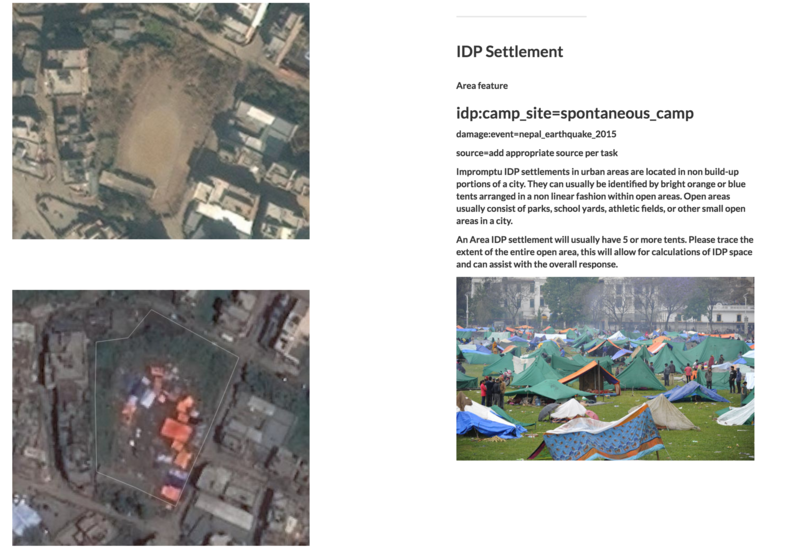 We mapped and worked with the single local agency in Kathmandu – the Kathmandu Living Labs – to understand the needs of aid responders on the ground, identify priority mapping areas, procure digital aerial and satellite imagery, design print maps, and communicate the needs to the global community over Skype and Internet Relay Chat. During the earthquake, there were over 30 mapping projects involved in mapping different parts of Nepal. Within the 48 hours following the quake, over 2,000 mappers quadrupled road mileage and added 30% more buildings and infrastructure data. This is in addition to the data created by the local community well before the quake. These maps and data were used by agencies like the American Red Cross, Canadian Armed Force and the Nepalese National Army to support the effort of saving lives. Maps save lives. 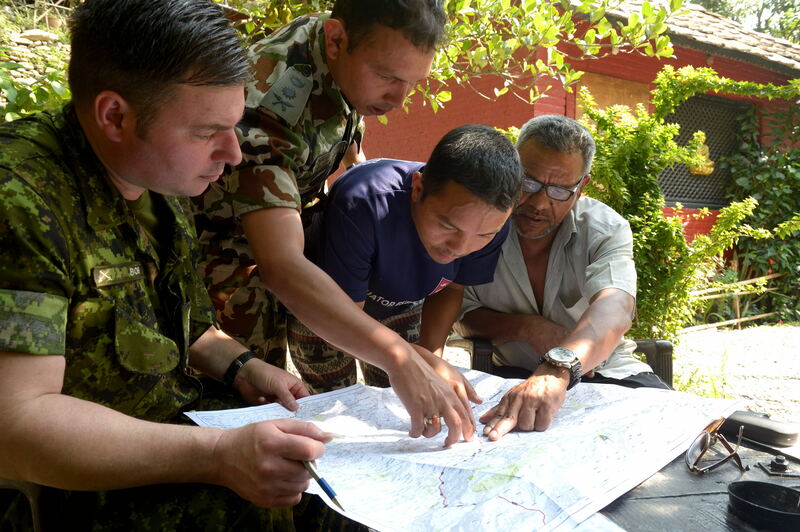 Captain James Borer, Canadian Armed Forces Disaster Assistance Response Team and Captain Animesh Adhikari, liaison officer for Nepalese National Army, discuss with local authorities about roads status, in Sindhupalchok District, Nepal. Photo by Corporal Kevin McMillan. 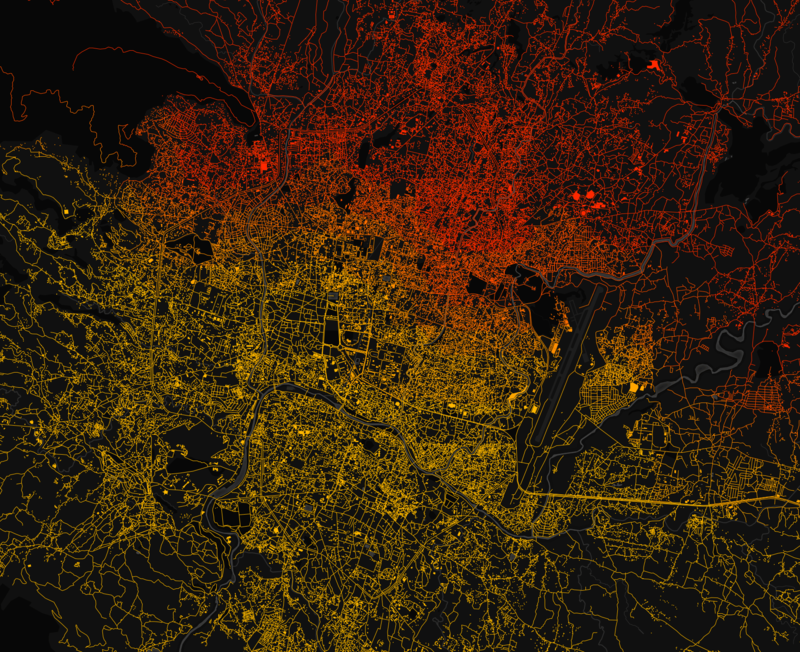 These maps and numbers are powerful – more powerful than the Geospatial Information Regulation Bill from the Government of India. The bill proposes to control acquisition, dissemination, publication and distribution of geospatial data both within India and by Indian citizens outside the country. The Bill will make years of work of millions of geographers, cartographers, and technologists around the world, including mine, futile and potentially illegal or criminal. In January 2016, when Chennai was hit by a massive flood that displaced over 1.8 million people, citizen collectives and organisations came together to the rescue. With fellow cartographers and volunteers, we created a map to identify flooded streets to facilitate transporting food, water and consumables into the city from elsewhere. 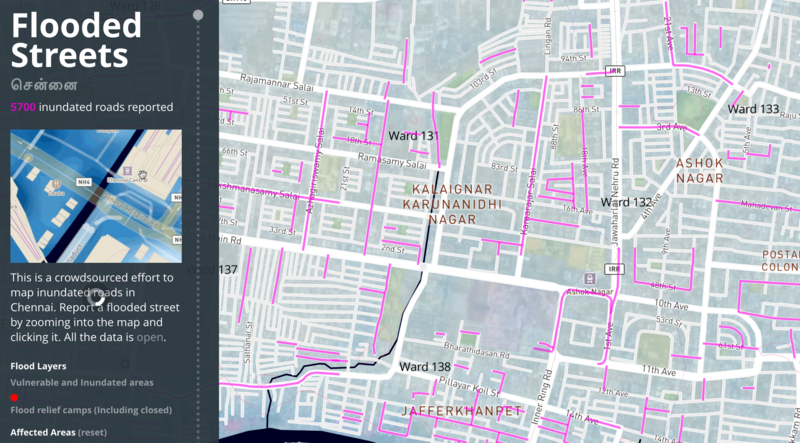 Earlier, in October 2015, when parts of Afghanistan and Pakistan were hit by a 7.5 magnitude earthquake, volunteers got together to create maps, but unclear mapping laws made it complicated. Soon after, I wrote about what change I would like to see in the HOT community – being able to work closely with traditional agencies. The proposed Geospatial Information Regulation Bill has the effect to shutdown Humanitarian OpenStreetMap Team in India and silence volunteer mappers, cartographers, and data analysts who support humanitarian response, basically stopping them from saving lives. The Bill prevents any individual or organisation from using satellite or aerial imagery; it also blocks the use of assisted equipments to collect geospatial information and the possession of such data. This means that, from now on, no one will ever be able to make a map of India, or parts of this country, for anything – humanitarian or business – without the approval of the authorities. The potential consequences of the Bill are dramatic. Preventing people from making maps affects how they live in our country, it breaks down disaster response, and troubles our economy. We need your help to save the map. Wrote a rather detail post about the new maps for Karnataka Learning Partnership on the geohackers.in blog. The map is an important part of our project, action and process because it serves as the pivot point of navigation. I will quickly talk about the data and tools before we discuss the design aspects. Me and Saalim turned up at FOSSMeet 2011 to speak about OpenStreetMap and map the campus. The presentation is here. Unfortunately, there weren’t much volunteers for the mapping party. We got them loving Potlatch 2. Setting up Mapnik for rendering tiles in your language. Mapnik is the default renderer on the OpenStreetMap main site. 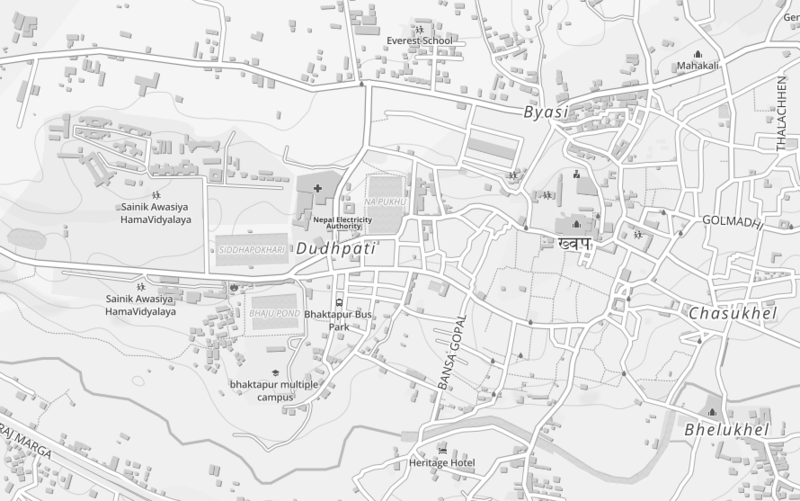 We can setup our own OpenStreetMap server for rendering the tiles either online or offline. This note would help you to setup an offline one (online if you do on your server) with special eye on font setup for localized tiles. To render the tiles using Mapnik, you need to create a PostgreSQL database out of the OSM data. Then install Mapnik depending on the Operating System you run. These primary steps are very well covered in the following pointers. Setting up PostgreSQL database out of the OSM data. Read more. Build your own OpenStreetMap server – Richard Weait. Read more. For Ubuntu Lucid Lynx read here. Using Mapnik for rendering the tiles – Richard Weait. Read more. Once you are done with the above steps, we might think of tweaking the Mapnik rules to render the tiles in a local language. For this all we need to do is point Mapnik to the right font. You can quickly follow the steps briefed by Richard, here. Next, you need to copy the required fonts to the above directory. You might run the python code snippet again to see whether Mapnik recognizes the fonts. For example, in my case, it looks like this. Note the name of the font that appears in the above list. This name would be used in the Mapnik rule file. Now, we’ll edit the Mapnik custom rule file, as described below. You can find this in ~/mapnik/<template name>.xml. Open the file in an editor of your choice. The file begins with something like this. Change the face_name to the font name we just copied to the fonts directory. In my case, it would look like this. Mapnik rule file defines fonts for each of the possible tags which appear in the map data. You need change that in order to apply the special fonts to specific tags. You can edit the lines which are like as shown above. Change the fontset_name, to the one you want. And run the renderer! You are done! I have two images to egg you on! Thanks to the #osm channel irc.oftc.net and Richard Weait for helping out to figure the changes.